The gold standard of fails. 1. Look, we've all been there. 2. When something just doesn't quite pan out, no matter how hard you try. 3. And eventually, someone, somewhere, ends up with a tattoo like this, that gets more and more wrong the longer you look at it. 4. We've all had those moments when you just can't figure out what's going wrong. 5. Like this girl, who just wanted Kylie Jenner lips, but it didn't quite work out. 6. Or this girl's brother, who probably won't be using technology again for a while. 7. Or even this mom, who's going full parent. 8. Disappointment is just around the corner from elation. 9. And tragedy just around the corner from hope. 10. Can any of us honestly say we haven't just completely failed, once in a while? 11. The person who has accidentally eaten soap is all of us, on some level. 12. So just watch this hockey player hit himself with his own stick. 13. And this person, who has misheard something for their whole damn life. 14. Watch this man do something dumb that he just didn't think though. 15. This girl is fulfilling all your worst fears. 16. This reporter should have ducked. 17. This frog is straight-up mean. 18. And this ambition is flawed. 19. 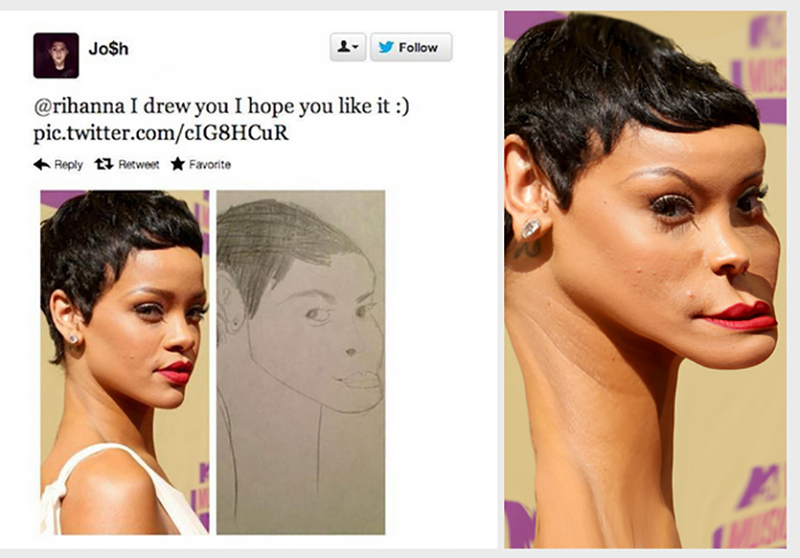 Maybe, in a way, this drawing of Rihanna really is art? 20. And at least you know this man getting hit in the head by a plastic barrel had his heart in the right place. 21. This would make your day terrible so very, very quickly. 22. This person thought they were being clever, but it just didn't work out. 23. And this is why no one should ever try to do cool stuff right next to a moving train. 24. It's also important to make sure your job application is attached, not a Chilli Beef recipe. 25. You should also look very carefully at the instructions. 26. But there it is – at the end of the day, we've all made mistakes. 27. Maybe we haven't all been confused by a statue. 28. But we've all definitely missed a train. 29. Sometimes, it just doesn't go to plan. 30. See this man, making the greatest mistake you could ever make. 31. Or this man, unable to control his dog. 32. Or even A$AP Ferg, reading too quickly and getting hella confused. 33. Some ideas don't work out. 34. Sometimes passion goes too far. 35. So watch this man accidentally throw a bottle of champagne at himself.